Acoustic Linings to a supermarket loading bay (measuring approximately 12m wide, 3m deep and 6m high) for an established shop-fitting contractor and well known, nationwide retail outlet. Following an independent Noise Impact Report for the Local Authority (part of the Planning process for night time deliveries & offloading) - to undertake a full site survey, design, manufacture, deliver and install acoustically absorptive panels to the loading bay area. To be fit for purpose in providing an appropriate noise reduction to neighbouring residential properties, structurally sound, weatherproof, and capable of withstanding the relevant wind & snow loadings etc., whilst being functional & aesthetically pleasing. Supporting steelwork & lining panels pre-drilled with rainwater drainage holes, galvanised, then powder-coated in the customer’s chosen colours (and panel cores totally encapsulated in a melinex membrane) to provide a protective coating with a guaranteed minimum life expectancy of 15 years. 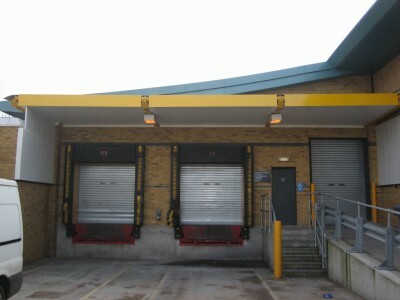 Installation undertaken during restricted times (between deliveries, day time) to ensure continuation of supplies to the store. Night time noise levels were reduced from between 60-65dBA to less than 55dBA, consistent with the WHO (World Health Organisation) guidelines to protect vulnerable groups against sleep disturbance and ensure that delivery vehicles & offloading in the service yard could be undertaken 24 hours a day without disturbing the nearby residents, even when sleeping with their bedroom windows open during the quietest part of the night.